This cam action fixture clamp provides positive down force while using very little space on the fixture. Workpieces can be clamped in series by using the back surface of a clamp to locate the next workpiece. The hardened steel clamping element has both a smooth surface for machined workpieces and a serrated clamping surface for rougher work. The height of the clamp can be adjusted by milling the slot deeper in the fixture plate. 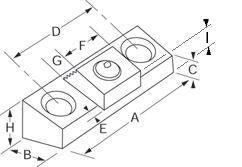 + "E" is the distance needed between the front of the clamp base and the workpiece. * "I" is the distance from the tope of the washer to the bottom of the clamp body.